To insure a dry and clean cabinet, I came up with the High-Sider™ Litter Pan, it is a custom fit plastic re-engineered litter pan just for my older 2006 – 2013 Out of Sight Litter Box™ cabinets. 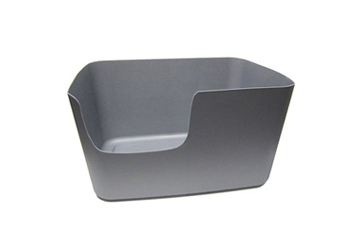 The High-Sider™ Litter Pan fits tightly into the cabinet and is 10 1/2 inches tall (19 inch x 14 inch x 10.5 tall). The High-Sider™ Litter Pan is great for multi-cat households. Note: This pan is too small for my new larger cabinet, 2015 on. Color: Gray.